Members of the fire service totally understand a motorist’s frustration when trapped in their neighborhood or complex by fire hose laid in the street or driveway. 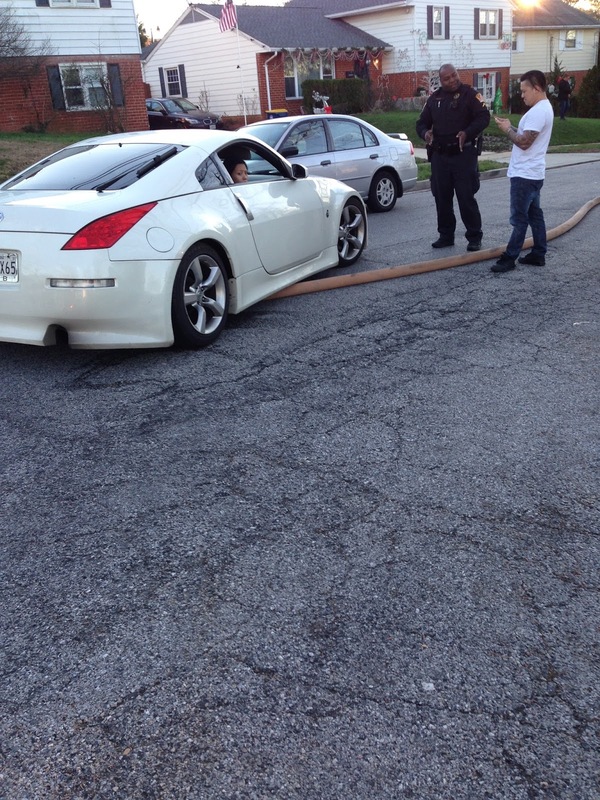 We may understand your frustration but we can not allow you to drive over our hoses. Motorists need to understand that we need to do what we have to do to perform our job of extinguishing fires. The primary reason hose lines are laid is to establish a continuous water supply from a water hydrant or other sources of water through a fire engine or pumper to the hoses used by firefighters to extinguish fires. Any interruption in this water supply could endanger firefighters inside of a burning structure and delay extinguishment. Driving over a non-charged hose line (no water in hose) or charged hose line (water in hose) is dangerous for firefighters, yourself and your vehicle. It is also a violation of the law. Driving over a non-charged hose line could cause the hose to become entangled with the underside of your car and any moving part. This would prevent that hose line from becoming a charged hose line and delaying the extinguishment of a fire and endangering firefighters. Your vehicle could also sustain serious damage. Driving over a charged hose line could cause the hose to break allowing a high-pressure release of water. This action will limit or stop the water and pressure supplying firefighting activity. Additionally, you could become injured from the high-pressure release of water and your vehicle could be damaged. If endangering firefighters, injuring yourself and others, damaging hose lines and your vehicle and delaying extinguishment of a fire is not enough, there is a law restricting motorists from driving over firefighting hose lines. 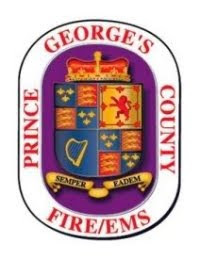 Unless the driver has the consent of the fire department official in command, the driver of a vehicle may not drive over any unprotected hose of a fire department that is laid down on any highway or private driveway. There is a $70 fine. $110 if it causes a collision. Most states have similar laws addressing this violation. We are providing a warning to all motorists that when they see a firefighters hose line in the street: DO NOT CROSS THAT LINE. This is a law we can live with. 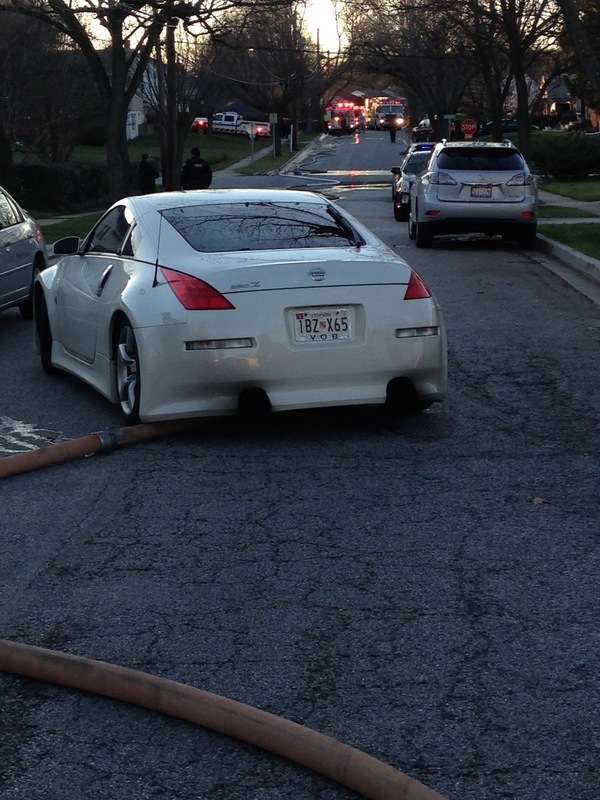 A recent house fire in New Carrollton resulted in charged hose lines in the roadway. This driver thought he could negotiate over the lines. He thought wrong!!! His vehicle became stuck and was not allowed to move. 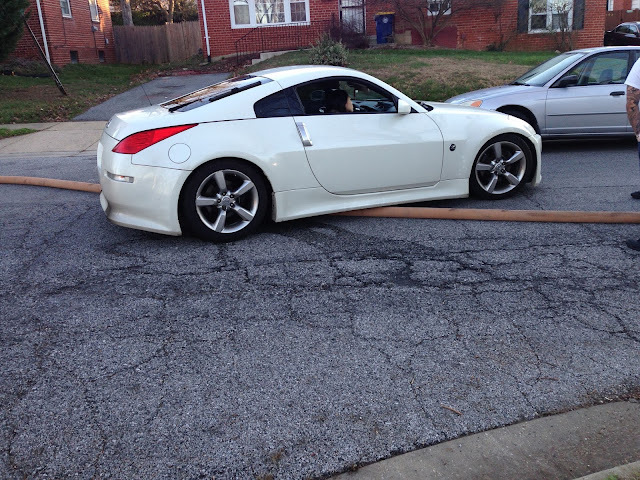 The driver is seen discussing the matter with a New Carrollton Police Officer. 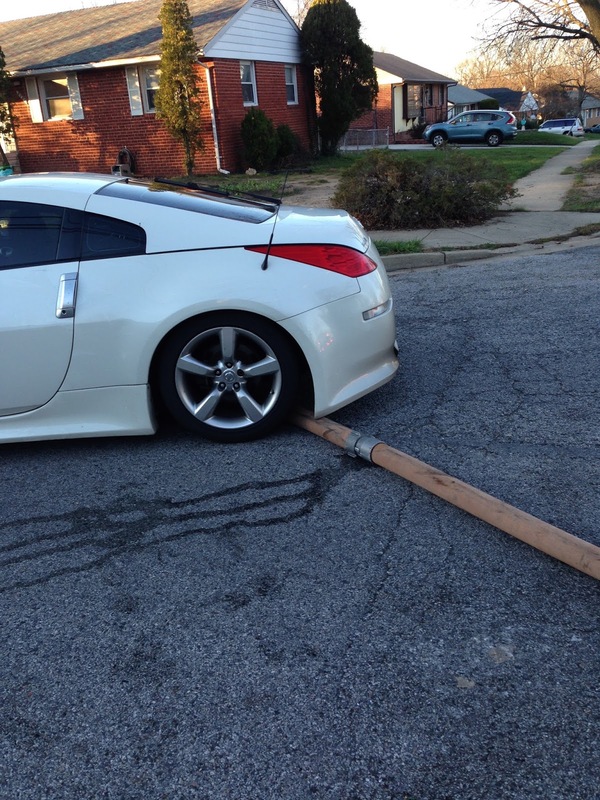 (Image (4) by PGFD AFC Steve White). A line you can not cross!! !